Configure the Ad-Watch Live! settings. Ad-Watch Live! modules: Choose which Ad-Watch Live! modules to have on or off. Spyware Heuristics: Files are analyzed with behavior-based detection. A method of detecting unknown malware using systems of rules and patterns. 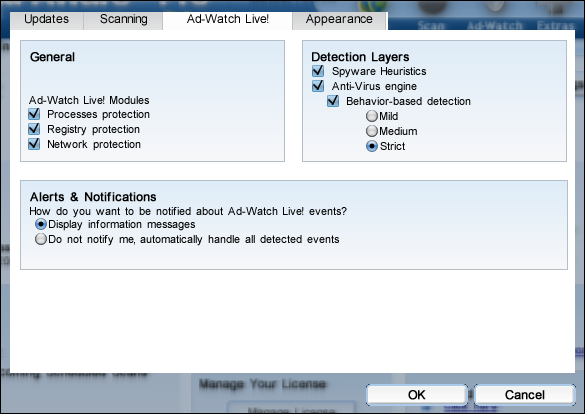 Anti-virus engine: Check this box to use Ad-Aware’s extended anti-virus scanner. If you choose to scan using behavior-based detection, select the level to be used. Choose how you want to be notified about Ad-Watch Live! events. Display information messages: All information messages are displayed in the tray icon. Do not notify me, automatically handle all detected events: Events are automatically handled and no Ad-Watch notification will appear in the system tray. Click “Ok” to apply any changes made. Click “Cancel” to cancel any changes made and to close the settings window.